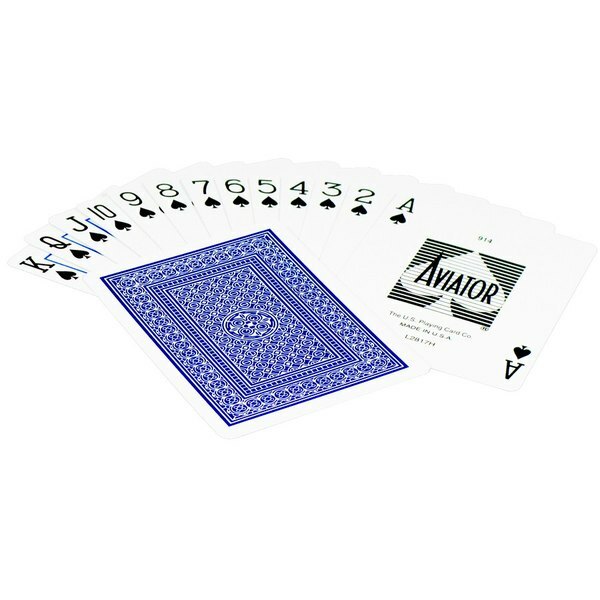 Keep guests at your gathering entertained with this deck of Aviator Poker playing cards! Featuring colorful designs, a slick laminated finish, and a crisp feel, this deck is sure to bring hours of fun to the playing table. This deck of 52 cards is perfect for all your traditional card games from Texas Hold 'Em to Go Fish! Ideal for bars, pubs, cafes, catered events, private functions, or even family reunions, this traditional game brings a nostalgic and comforting feel all around. Complete with instruction and rule cards, you have everything you need to start the fun! 52 cards are in this laminated Aviator Playing Card deck. These cards may arrive in red or blue depending on supply as they are popular. If used for poker, instruction cards are included, or this deck can be used for children to play Go Fish. The Aviator Playing Cards - Poker is going to be the best bang for your buck, inexpensive price but these are pretty nice and well put together cards and nice quality. I would definitely recommend. I was impressed by the quality of these cards. This is a standard sized deck that's easy to shuffle right out of the pack. Perfect for playing solitaire, poker, or your game of choice. The Aviator Playing Cards- Poker are very durable and well made. They don't fade easily and are heavy weight They are great for every day use. I would recommend these. These Aviator Playing Cards are a beautiful set of cards. They are smooth and easy to shuffle. They don't stick together at all and are a great size, easy to read, with bright images on them, and make playing games easy and fun. Great deck of cards to keep on hand in the home or at the bar. Poker size is easy to use and read. Durable cards that will last! Another great set of playing cards. Having playing cards on hand is is great for entertaining children. From simple magic tricks to good old Texas Hold-Em, having a set of playing cards around is something we always do. These cards are much cheaper here then at a local store. Great poker cards that have a nice weight and gloss to them. There is also an instruction card included in the pack. Best of all is the price! I ordered the Aviator Playing Cards-Poker and was impressed at their beyond reasonable price. The size and stability of these cards is impressive and I would order them again for sure because they are the perfect addition to any game night. I like how easy it is to order and will continue to do so. I hope to see additional games offered soon. Would highly recommend for residential use. I absolutely love this product! I just love playing cards! Poker is one of my favorite games! This pack came in perfect condition and came with an instruction card! Very nice standard deck of playing cards. Nice gloss on the cards so they wont get super dirty after a few uses. At this price what are you waiting for?? Great cards to have on hand especially while the BBQ is still cooking you can play a few games of poker with these exceptional and durable playing cards. 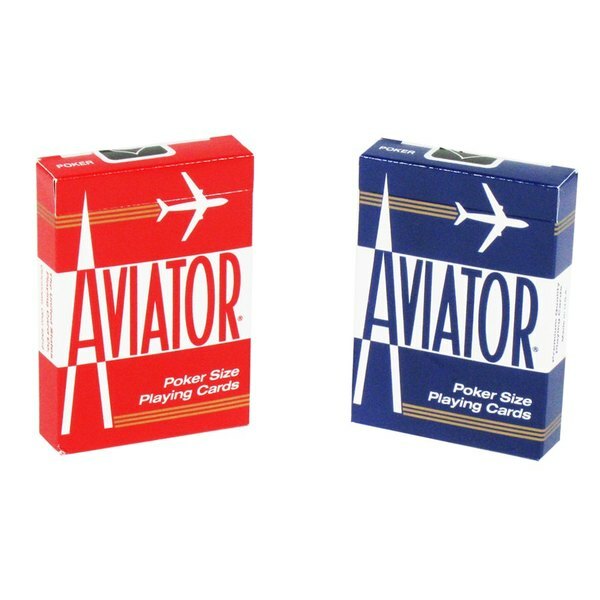 I found Aviator cards are the same as the other premium brands out there like Bicycle Playing Cards. I think the same people even make them. You just save a bit of money. 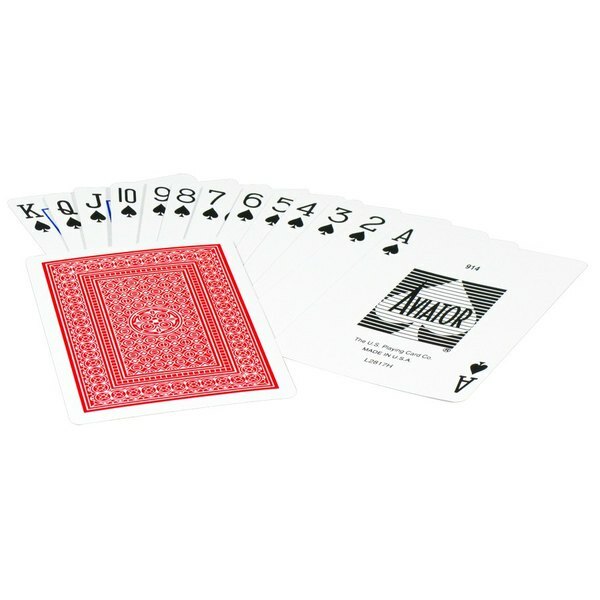 Aviator poker cards are a perfect playing card for recreational games of poker. We ordered these simply to provide a way to entertain customers while they sip their drinks. Nice, casino quality. Cool playing cards and a fun game to pass time. The cards are durable and they come at a good bargain. Very happy with this purchase. These cards are of very quality construction. They feel and play just like a normal deck of cards. They're a reputable brand and look nice on the tables. They would do well in a bar or pub where cards are often needed. These aviator cards are great for making card houses. They stack very well and have a great matte finish. They look very attractive on a coffee table. The price point on these was great for the quality. They definitely don't feel like some cheaper cards that I have come across. I would recommend them for the value. I was so pleased that these arrived so quickly. They are a nice deck, the price was great, and we were able to enjoy a quiet game with our friends over the holiday visit. Nice playing cards with nice big lettering and a good feel in the hand. The cards run really well and our customers appreciate getting a fresh nice deck. I really like these Aviator Playing cards. Overall, I think they are a great buy, just your basic playing cards. Great price as well. I would recommend them. We sell these behind the counter, and this is the brand our customers prefer. This is the best price we've found anywhere, especially for small quantities! Great cards to use, whether for playing with them or using for magic, they are super smooth and feel nice. This is a great price for them and you wont find them cheaper. This is a nice pack of cards. Not your cheap dollar store stuff. Smooth, stylish, not too thick and of good quality. Good bargain too.